The batteries for electric cars use a lot of lithium, the lightest metal and the lightest solid element under normal conditions. Chile produces the largest amount of lithium (8,800 tonnes per year), with other big producers including Argentina and China, while Bolivia has the world’s largest known reserves. Other metals used in electric cars include copper, cobalt, aluminum, nickel and sometimes manganese, along with conductive non-metal graphite. It has been suggested that we will struggle to create large numbers of electric cars in Europe in the near term, simply because we don’t have sufficient access to sources of lithium to make the batteries and we don’t have the factories to make them in either. 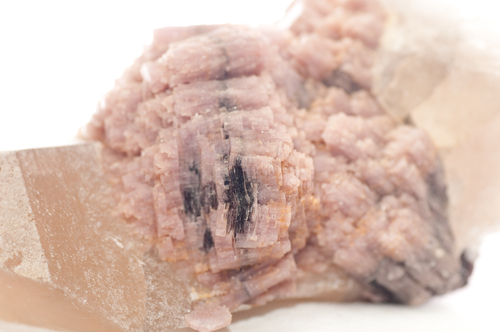 Photo (right) of lepidolite, a lithium-bearing mineral. To get a real idea of how much greenhouse gas is emitted during the manufacture of an electric car, you have to look at how its components are sourced and made. The raw materials for making the car have to be mined, and the process of mining creates a lot of greenhouse gases. Then the raw materials have to be refined before they can be used, which again emits more greenhouse gas. Then more greenhouse gas is emitted in the manufacturing process. Of course the above is also true when manufacturing a petrol or diesel car. In fact, taking into account the whole production process, making a petrol or diesel car releases about 7 to 10 tonnes of CO2. Making electric car releases roughly the same amount of CO2, but then you have to add in the production of the battery. Estimates suggest that 150kg of CO2 are released for every 1 kiloWatt hour (kWh) of battery capacity. For an electric car to have a decent range (say 300 miles) between charges, it needs a battery that’s at least 60kWh in capacity. This means that a further 9 tonnes of CO2 will be emitted during the making of an electric car, giving a total of 16-19 tonnes of CO2 emitted. So at this point, an electric car seems worse for the environment than a fossil fuel one. The environmental impact of an electric car can increase or decrease considerably depending on how the electricity that charges its battery is made. A coal-fired power station emits 800-850 grams of CO2 per kWh (recent estimates suggest this may be lower, at 650g per kWh), whilst a cleaner, gas-fired power station emits 350-400g CO2 per kWh. Using renewable energy, like solar panels or wind turbines, around 36g CO2 is emitted per kWh, taking into account the emissions created during their manufacturing process. So if a car is recharged using renewable energy, its negative impact on the environment is far lower than if it’s charged using electricity from a coal-fired power station. The purchase price of electric cars does tend to be considerably higher than a petrol or diesel-engined version of the same car. But this is where the increased costs end. A 30 minute fast recharge from a dedicated charging point at a service station costs around £6 - not much more than it costs for a gallon of diesel or petrol and in some cases it’s actually free. An overnight charge from a dedicated charging point installed at someone’s home can provide around 100 miles of driving for about £2. Servicing of electric cars tends to be cheaper, as there are very few moving parts and no filters or oil to change. The most expensive part of an electric car - its battery - tends now to be highly reliable, and is covered by a long warranty or can be leased from the manufacturer. So looking at longer term ownership rather than initial purchase price, electric cars can actually be cheaper than their petrol or diesel counterparts. Although battery technology is improving all the time, this is a fact at the moment. The best electric cars now have ranges of around 300 miles between charges. But many have a range of just 100 miles or less between charges, which means they are much more suited for use in cities and on short, local journeys, rather than for long-distance travel. And to recharge them, they need at least half an hour of charging at a dedicated, high voltage charging point - the kind you see at motorway services. Compare that with the time it takes to fill the tank of a petrol or diesel-engined car and the fact that many new cars can now go 500 miles or more between refills and it’s obvious that fossil fuels still have a distinct advantage in this area. Using the heater or air con in an electric car will also have an impact on their range, and batteries hold less charge when it’s cold. Currently in the UK, there are around 4,000 publicly accessible charging points with a total of 13,000 plug sockets. Of these, only about 2,600 are rapid charging points that can fully charge an electric car like the Nissan Leaf in 30 minutes. By 2025, the number of sockets is set to increase to 80,000. This compares reasonably well with the 8,746 petrol stations currently open across the UK. But as noted above, filling a car with diesel or petrol takes a couple of minutes, not 30 minutes or more. Many people get round this by having their own charging point installed at home. But that’s not really an option for people living in streets of terraced housing where on-street parking means they often have to park their cars some distance from their house. So as we shift to using more and more electric vehicles, we’ll have to think about how we keep them charged up. The electric vehicle may become the new smartphone, the next device that’s essential for getting us through our day that we have to keep charged up and ready for action. The need to charge our vehicles could potentially cause problems. What if everyone plugs their car into a charger when they arrive at work at 9am, or when they get home at 6pm? How will the surge in demand be dealt with? 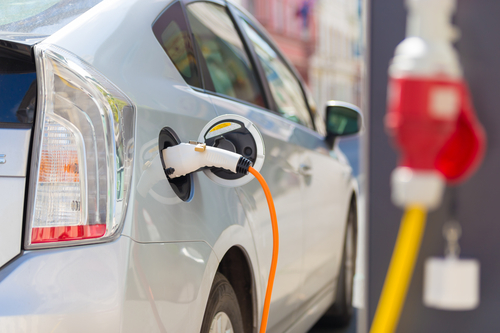 Read More: What are the benefits of electric cars?